Here we are eight hours away from tip-off of game six of the 2010 NBA finals and the question that has been in my head for two weeks now is; what is Kobe Bryant’s legacy going to be at the end of this year’s NBA finals? In today’s sports world, players are scrutinized and judged and in some cases pre-judged minute by minute with every shot, catch, pass, pitch, rebound, hit, touchdown or home run they do or don’t make. Two months ago during the eastern conference semi-finals, a few members of the media started to comment or ponder about Lebron James’s legacy. Most people including myself felt that discussing or even trying to make a legacy for Lebron was very premature despite the fact that he has been in the NBA for seven years now. On the other hand, discussing Kobe Bryant’s legacy or trying to judge it is very much okay at this stage of his career. Thirteen years, four NBA championships, one finals MVP, one regular season MVP and one gold medal later, most if not everyone would say that he has lived up to the expectations that were placed on him coming out of high school. Kobe has come a long way since the days of not being able to beat out Eddie Jones for the starting two guard spot on the Lakers, or shooting air ball three point attempts in the western conference playoffs. Kobe’s legacy as it stands now is very impressive and one that many NBA players wish they had attached to their name. Although, no matter what Kobe does or has done, he is always compared to Michael Jordan and possibly will always be compared to Mike. 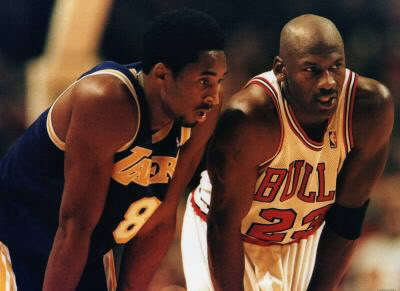 The Black Mamba has accomplished a lot in his career and has done some amazing things on the court that are Jordan like. But despite winning four NBA championships, MVP awards and a gold medal, most people feel as if he needs to win six NBA championships like Mike did in order to be like Mike. People like to mention that out of Kobe’s four NBA championships, three of those were won when Shaquille O’Neal who is considered to be one of the greatest centers of all-time, was Kobe’s team mate. Kobe critics and NBA fans say that the reason the Lakers won those three championships were because of Shaq not Kobe. Some question Kobe’s ability to elevate his team and not just himself to a championship level like Michael Jordan routinely did with his Bulls teams. Then you have those people who simply question his greatness. Yes Kobe is known as the game’s best closer, but compared to Mike, some if not most people say that Kobe isn’t on Mike’s level. Kobe vindicated himself by leading the Lakers to a NBA championship last year, but as I stated in a previous blog before game one of the 2010 NBA finals. Last year’s championship has somewhat been devalued in the eyes of many non-Lakers fans. The Orlando Magic were not a serious threat to the Lakers last year. This is the series that non Lakers fans around the world want to see. It has become Kobe’s moment of truth. People want to see if Kobe is one of the greats of the game or just a great player. So to answer my own question of, what will Kobe Bryant’s legacy be after this year’s NBA finals? In my opinion, if Kobe goes on to bring the Lakers back from a 3-2 deficit to win the NBA championship. His legacy will go from platinum to elite status and I would have to seriously think about where he ranks amongst the NBA greats. I wouldn’t put him above Jordan, Magic or Bird. But he would be in my top ten for sure. If the Black Mamba comes up short this year, his legacy will take a major hit and the comparison to Michael Jordan will almost be blasphemy if it already isn’t to some people. I personally will consider him one of the greatest players of all-time, although I couldn’t put him in my top five or ten of greatest players of all time. He currently is and will always be the sugar free version of Michael Jordan to me. 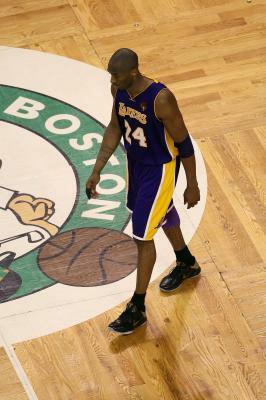 Losing championships in a watered down NBA doesn’t look good on Kobe’s resume if he loses this series to the Celtics. Unfortunately in this country a player’s legacy is based on many things, but the most important thing is championships.